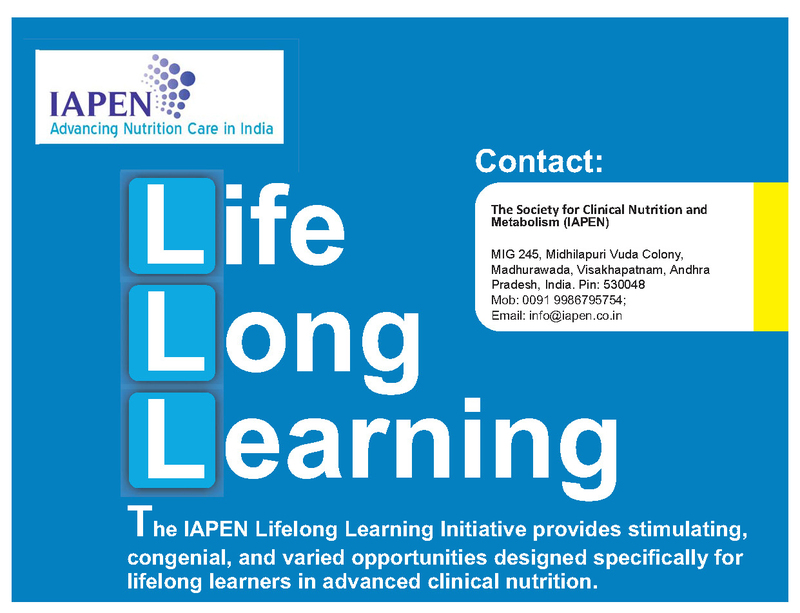 In order to promote life long learning in basic and advanced clinical nutrition and to facilitate the academic pursuits of more number of clinical nutritionists, doctors, dieticians from the educational institutions, hospitals and health care settings, IAPEN announces various distance learning courses in clinical nutrition. For more information about courses, mail to info@iapen.co.in or check our certificate course page. Important Note: All certificate courses are offered through Distance Learning ONLY. The Course fee for each course is INR 70000 (Course Fee) + 18% GST (Indians) or USD 950 + 18% Tax (Abroad). The course fee includes examination fee, international edition books, course material and all major costs for smooth completion of the course. The Fee Structure for Nursing and Pharmacy Courses are different. The fee for sports nutrition course is INR 25000 + 18% GST. Patients: IAPEN also allows patients to join these courses. Patients will not be awarded certificates. The discount of 60% is directly applicable to all patients interested in joining IAPEN courses. The certificate is valid in 70 countries throughout the world. The support for lifelong learning will continue until the end of the career. Note: The courses are research courses with Project Work Component and Course Work. A guide will be allocated after completing two modules. Our Inspiring Lifelong Learners, who had put faith in IAPEN and enrolled in these advanced courses. IAPEN is a multidisciplinary society devoted to the study of metabolic problems associated with acute diseases and their nutritional implications and management. Doctors, Dietitians, Nursing and Pharma come together and participate in lifelong learning. 1. Basic qualification required for taking admission to the course? Candidates having Biochemistry in his or her under graduation or post graduation as one subject with laboratory are eligible for taking up this course. Home science students without Biochemistry subject can also take this course. 2. I do not have Biochemistry as one subject in Under Graduation or Post Graduation, Can I take the course? Yes, we will not stop candidates from learning. For the educational purpose and for the learning purpose, we can offer this course along with extra free module "Biochemistry". Such candidates will not get any certificate from IAPEN but can join this course and learn the subject. In case, if they wish to get a certificate from IAPEN, candidates can join in any Distance Learning Program offered by any University in India or Abroad with Biochemistry as one subject. After verification, IAPEN will issue the certificate. 3. I am employed and how can I do project work? All hospitals are not equipped with all kinds of facilities. Candidates need not go anywhere to do project work. The candidate has to apply the concepts which were taught in the modules to their daily routine work. Somehow the application has to be done and we will guide during that process. The candidate has to observe his or her daily routine work and see the possibilities. A small patient form can be changed or some extra analysis can be done or some new formula can be added or some new procedure can be developed with the help of senior doctors etc.. It all depends on the workplace, flexibility and encouragement from the Head of the Department or Organization. The examination final question paper will be mailed to your email ID. Candidates can take help from Internet, read books, ask friends or peer group and can send the answers via email within four to five working days. This will mimic the situation when a typical critical care case arises. In such critical timings, the clinicians have three different options, they will be checking the internet, reading books or asking friends or peer group. The examination pass percentage is 85%. The examination can also be conducted offline but it will be really tough as it is difficult to answer the questions within less time. 5. How will be the examination question paper? The examination paper consists of 35 Multiple Choice Questions per One Module. The candidates have to answer only 25 Multiple Choice Questions per One Module. The candidates have 10 questions choice per module. If four modules are present in the course, then the examination consists of 140 questions (35 per Module * 4 Modules). The candidate has to answer ONLY 100 questions. There is no negative marking. The questions are practical oriented and require a lot of experience and expertise to answer. PG-SGA is one Nutrition Assessment Technique. In this nutrition assessment technique, "Triceps Skin Fold" has to be assessed. If we check on internet about Triceps Skin Fold and How it is measured, then it will show Multiple Choice a, b and c. (Triceps Skin Fold Chart, Triceps Skin Fold Tables, Triceps Equipment). But if any person, who implements PG-SGA on routine basis knows that the analysis has to be done Subjectively without using any Instrument or Resources. The correct answer is (e) None of the above. The questions have to be carefully analysed and answered. The candidates can take their own time in answering the questions. In case of above question, if the candidate asks their peer group about measuring "Triceps Skin Fold" then they will surely tell a, b and c options. The candidate has to ask some expert, who is really applying SGA or PG-SGA to ge the correct answer. Careful analysis is required before answering. 6. Is publication a mandatory? Publication is not mandatory. There are several options which are present for getting project marks. One component is a publication which carries more marks. The other components which carries marks are Conference paper presentation, project report preparation, project novelty, project type (case study or research or review etc..), presentation before a local committee at your organization (Ethical Committee) or IAPEN Chapter Committee, preparation of manuscript without publication etc. The candidate can choose any option for getting project marks. Nothing is mandatory in our lifelong learning program. 7. What is the difference between lifelong learning and learning? In what way IAPEN Courses are different from courses offered by any other organizations or universities. Learning: Lifelong learning is one component which will be taught while taking up courses from any organization or university. Candidates, who are not interested in Lifelong Learning will also get a certificate as it is only one component out of many components present in the course. These courses offered by universities consists of offline classes or online classes, lectures, laboratories, assignments, tough problems, professors or teachers to guide, hand hold and sometimes spoon feed etc..
IAPEN Courses or Lifelong Learning: The candidates who have completed their education (MD, PhD, MS, MSc, MBBS, BS etc..) and gained some years of experience in some organization(s) and wish to improve his or her knowledge can join these lifelong learning courses. Lifelong learning or simply "Self Learning" is the major component or ONLY component offered by IAPEN Courses. The course is tailor-made in such a way that all major components of lifelong learning will be taught. The candidate should benchmark him or her with International Standards. From sending materials, reading books and encouraging the candidates to go for conference or publish in journals and carefully training them until they master and understand lifelong learning and its importance are part of this course. Candidates will also get help and guidance after completing the course until their end of the career. 1. Candidates require a lot of patience: The patients will always be tested during the course. As it is part and parcel of lifelong learning. Candidates should not leave or forget for one year or six months etc.. and should always ask for updates every 15 to 30 days. Lifelong learning requires a lot of patience. Learning patience will help in one of the most important components of lifelong learning i.e. "Publication". Top journals will take minimum 2 years for publication of research work. 2. Reading Books: About 4000 pages of materials and standard books will be sent to the candidate. The candidate should read each and every component present in the material within 4 months and master it. We will try to teach different techniques for mastering the material within a short time. This lifelong learning exercise will help in understanding the importance of standard books. 3. Journal publication: We will guide the candidate through the tough process of Journal Publication. It will take minimum 1 to 2 years for getting a publication in International Journal. Interested candidates can opt this and learn journal publication. 4. Reading Journal Articles: The candidates are encouraged to read journal articles and spend time on that. This will help in improving knowledge. 5. Conference Presentation: Candidates are advised to go to conferences and present paper or poster. The review comments by experts will help in reaching international standards. 6. Attending Workshops: Candidates are advised to attend workshop and sometimes conduct workshops by calling experts. Attending workshops will help improving the knowledge and conducting workshops will help in building up contacts. 7. Examination: Examination is like a Typical Case or New Situation in ICU. The candidate response at those situations will be checked during the examination. Candidates can ask help from peer group, friends, refer internet and standard books. The decision taken by the candidate should be correct and should help in protecting patient life. The threshold limits will be checked during the examination process. 8. Getting Certificate: The course is a part of lifelong learning initiative of IAPEN and candidates should remember that it is only "A Part". Remaining parts will also be given after completing the course. Lifelong commitment is expected for mastering advanced clinical nutrition. 9. Observational internships: Candidates are also encouraged to visit nearby hospitals or popular hospitals or doctors and stay for one to five days to observe, how things are happening. We will also help in getting these observational internships after paying prescribed fee. 10. Finance: Lifelong learning requires lot of financial resources and lot of commitment. For some years candidates are advised to arrange funds for lifelong learning. The course fee was decided based on that component. 11. Visiting and Observation: During the course, the candidates are advised to visit various departments inside the hospital to observe how things are happening. This will help in understanding the importance of observing and learning. Most of the things are present around us and we just have to observe and learn. 12. Assignments: The handwritten or soft copy assignments are one of the most important components of lifelong learning. The candidate has to search the answer inside the material. The candidate has to write only four lines per question. The hand written assignments or soft copy assignments will teach, three important components. 1. Searching information in standard books (Some books are very difficult to read and understanding them requires lot of knowledge but searching something will always be easy. It is called application based learning). 2. Important Pages inside the standard book: The candidate has to spending time on one or two pages for some time for writing the answer. These pages will get imprinted in his or her mind. In case and in future, if the candidate needs that information, they can readily refer to that material. Everything is not available in google.com or internet. Information from books is most important and it is considered as first hand information when compared with Internet. It promotes the candidate to purchase books in near future and also promotes lifelong learning. 3. Standard way of searching extra information in the Internet: While writing minimum 4 lines per question, the candidate can also refer to other resources like internet or asking peer group or doctors etc. 13. Doubts: When a candidate enroll for any course in any organization (Distance or Full Time), they can freely ask doubts to the professors without any hindrance but IAPEN courses are lifelong learning courses or Self Learning Courses. There is a procedure for asking doubts. First, the candidate has to refer to the books or material or refer to internet or journal articles and read more information about it until the doubt is clarified. Still, if the doubt is present then they can approach IAPEN or send email. Most of the doubts were clarified via email but still if the doubts are present then IAPEN will arrange for expert appointment. The candidate has to personally go the concerned expert and wait and take appointment and ask any doubt. If any personal attention is required, IAPEN is happy to help. IAPEN will help only after verifying that the candidate has spent enough time on that doubt and needs immediate help. This will promote lifelong learning. 14. Certification: IAPEN certificate is the certificate issued by PEN organization. PEN organizations are present all over the world including ESPEN, European Union, ASPEN, USA, BAPEN, UK, NESPEN, Netherlands, CSPEN, China etc. The certificate has its value throughout world and in India. After reading point 1 to point 13, candidates should understand that this self learning or lifelong learning course certificate will be issued to the candidates who have gone beyond those simple printed certificate paper materials or marks. This course is offered to candidates, who are well qualified (Minimum Master Degree) and wish to gain knowledge and wish to go beyond. The achievements for this course are treating or saving patients on daily basis by applying new concepts and advanced techniques on par with International Standards with Available Facilities ONLY, publishing in good international journals for sharing ideas and getting citations of the work and going to international or national conferences and interacting with experts at same level etc..
8. I am not working currently or I am final year student, can I join IAPEN course? Kindly read the answer to Question 7. We will not stop people from learning and after reading the answer to question 7, still if you are interested and committed then we will offer this course. 9. Is there any body to teach us personally during the course? Kindly read answer to Question 7. Yes, there are experts to help but for taking their help some standard is expected. We will surely teach personally when it is really required. Kindly do remember that this course is Lifelong Learning Course or Self Learning Course. 10. About course fee and what it will cover? 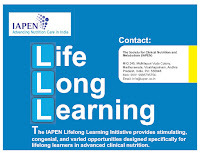 The course is a part of lifelong learning initiative of IAPEN. The course fee includes all components of lifelong learning. The course fee includes International Edition Standard Nutrition Books, Course Material, Examination Fee, Committee Sitting Fee (for listening to your presentation), proof reading of documents, assignments etc.. The major component of the course fee goes to "Books and Course Material" and proofreading by experts. The fee was also fixed based on the minimum financial requirements for lifelong learning. Candidates are advised to arrange at least INR 30,000/- (For India) per year and USD 1000/- (Abroad) per year for learning the purpose and for purchasing books and for travelling etc.. This amount is not for IAPEN course but for all components of lifelong learning. 11. Can I join this course by paying monthly instalments? Kindly read the answer to Question 7. Minimum Financial resources are required for Lifelong Learning. If the candidate does not have financial resources then it will become a problem for learning. One candidate, who have joined this course invested INR 2,00,000 to go abroad for learning new concepts. Some with salary less than INR 10000/- saved some money for few months and visited a big hospital in another state for an internship (10 days) and another candidate with salary INR 25000/- have saved money for one whole year to visit abroad. Sometimes, companies will also bring experts from abroad for promotional offers or conducts workshops etc.. It is not about money and it is about the commitment towards lifelong learning or saving money and going beyond for learning new concepts and new technologies. Many things are not available on the Internet. Personally visiting and practically learning is most important and that can be achieved only by travelling and going to various places for learning or by purchasing standard books. In case, if the candidate is not interested in travelling then they can purchase books from various countries and learn. All standard books are very costly and the books available for free download from the Internet are not recent books and do not have recent updates etc. Only 5 years old books are available on the internet for free download or through pirated websites and recent books are very costly. We suggest the candidates to save money and join so that it will really help. If you still want instalments, send email to info@iapen.co.in we can offer a maximum of two instalments without disturbing the course duration. More instalments will delay the purchase of books. 12. I completed the course, what's next? We will send online materials, videos and MCQs for lifelong learning in advanced clinical nutrition. We will also help in starting a small core group at your area to help more underprivileged people. We will monitor the lifelong learning activity by encouraging the candidates to take up ICNSC Examination. IAPEN will also give "Certified Nutrition Support Clinician" or "Certified Clinical Nutritionist" Certificate to all the candidates who have cleared ICNSC examination. After getting 25 Credit Points, IAPEN will issue Expert Certification. IAPEN will also maintain the Directory of these experts in the website and will also widely publicize to everyone including patients. 13. I cannot write assignments, it is too much for me, is there any other option? Yes, the ultimate aim is to learn. Candidates can confirm via email that they have read the required topics. The assignment is also simple i.e. 4 lines per question. We also request the candidates to mail us innovative options for assessment and we are ready to adopt them in the course. The ultimate aim is to learn and master clinical nutrition and treat critically ill patients. 14. I want a refund for the course? The course material cost is high. Refund for the course is not allowed. This is the best investment the candidate has done by purchasing world standard books by joining this course.